I’ve been on and off bread for a while now. More off than on. But sometimes I give in to that deliciously chewy sensation that comes when biting into a fresh butter croissant, or crunch waffle cone, or a sandwich. Most of the time, bread doesn’t even shake it’s finger at me. Most of the time, I can care less about a cookie, or a scone, or the pile of bagels in the multipurpose room at work. Most of the time I just say no, and there is no struggle. Yesterday I had a piece of bread with my Green Soup. And although it tasted great, it left my stomach questioning if it was worth it. Up until this point, I haven’t experienced any stomach issues with gluten. I swell up for sure if I eat too much. Imagine beached whale, with sausage fingers…. Normally my nose just runs. In fact, I have had a runny nose for the past 10+ years with no understanding as to why. Until one month where I stopped eating gluten for other reasons and wa-la. No post-nasal drip. Minor allergy problem solved. Ok, anyway. I woke up this morning with a still sour stomach. And I remembered as a kid the theory that if your stomach is sour, eat bread to soak up the sourness. Or maybe that was a theory in college – when I had too much to drink the night before… but it usually wasn’t bread alone that I thought as necessary. Jack-in-the-Box… please don’t judge. With Thanksgiving coming up, I am most looking forward to dressing. Or stuffing. We called it dressing in our house. But I feel the need to clarify, because at one Friendsgiving we hosted, I asked someone to bring the dressing and they almost brought Ranch. My mom makes the best dressing. Seriously. Its the most melt-in-your-mouth yumminess. But I am afraid of the gluten… and what I might do. So I played around with mom’s recipe and incorporated some non-glutenious squash in place of bread to see how it worked. Masterpiece I tell ya! Mom’s has a more gooey texture that is sure not to beat, however, the flavors in this are right on par. Worth trying. Preheat the oven to 400 degrees. In a large pan, heat turkey butter over medium heat. Add in diced onions, carrots, celery and mushrooms. When the veggies are sauteed, add in the ground turkey, sage, rosemary, salt and pepper. While the turkey is cooking, chop the ends of the squash. Carefully stand on one end and slice off the exterior skin. Cut in half and deseed. Now slice into 1″ cubes. Add cubes to the pan, along with diced apples. Cover with a lid and allow to cook for 10 minutes. Stir occasionally. Break up the cream cheese into chunks and toss in with the hot squash mixtures. Pour into a 9×13″ pan and top with Parmesan cheese. Bake for 15 minutes or until bubbly. *I thought the apples made for a nice surprise, how ever my husband felt the squash was sweet enough and the apples competed with the flavor of the rosemary. So I leave these up to you to put in if you wish. Some like a sweeter dressing and others opt for more savory. Let me know what you’ve tried in the comments below. Don’t forget to follow me on Facebook. So as I said yesterday, I went shopping for this wedding I’m cooking for on Wednesday. As always, I over did it. I am only cooking for 30 but I planned for 300. And I bought way too much food. Good news is, I can still use it. Tonight, I decided I’d use up some excess spinach and cauliflower. 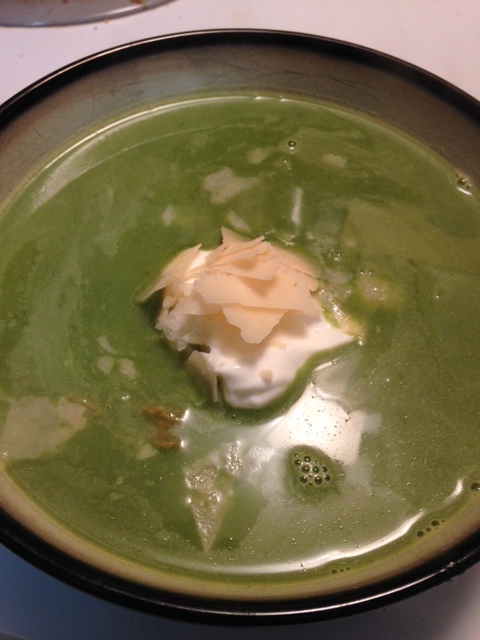 So I made what I’ll call Green Soup. It was creamy, savory, simple, and chalk full of vegg, at only 150ish calories for a big bowl. It is sure to warm you up on these colder nights. In a large soup pot, heat butter over medium heat. 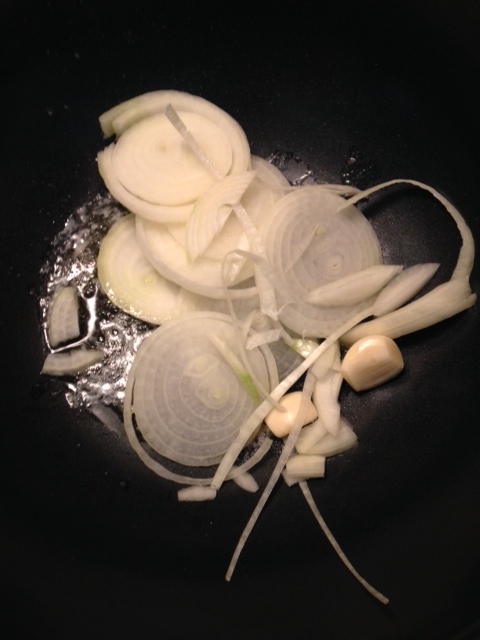 Add in sliced onions and garlic cloves. There is no need to chop these small, you’ll be pureeing them later. 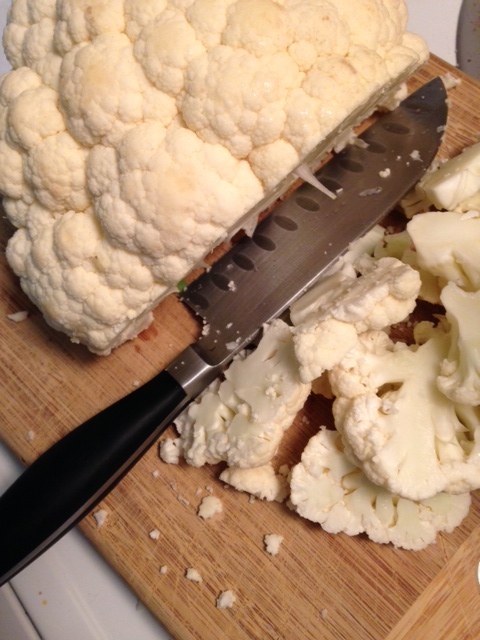 Roughly chop the whole head of cauliflower, including the stem. Add to the onion and garlic. Add in broth, and bring to a boil. Simmer for 5 minutes or so to soften the cauliflower. 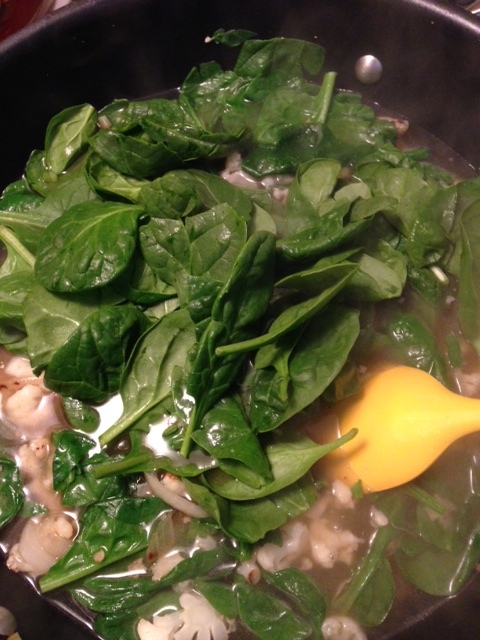 Add in the spinach. Stir. 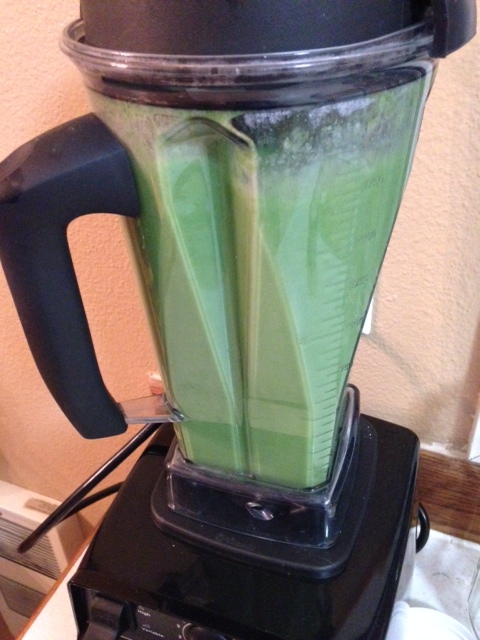 Transfer to a blender, or use a stick blender to puree the soup. Serve with an ounce of Greek yogurt and a tablespoon of Parmesan cheese. Enjoy! Posted in Soups, Vegetarian and tagged cold nights, dinner, family friendly, healthy cooking, healthy food, healthy recipe, kid friendly, low calorie, low fat, soup, spinach. Bookmark the permalink. This coming Wednesday, the day before Thanksgiving, I am catering a wedding. Yea I just said it. I am catering a wedding! WHAT!!!! I am pretty excited about this. I can put my cooking skills to the test. 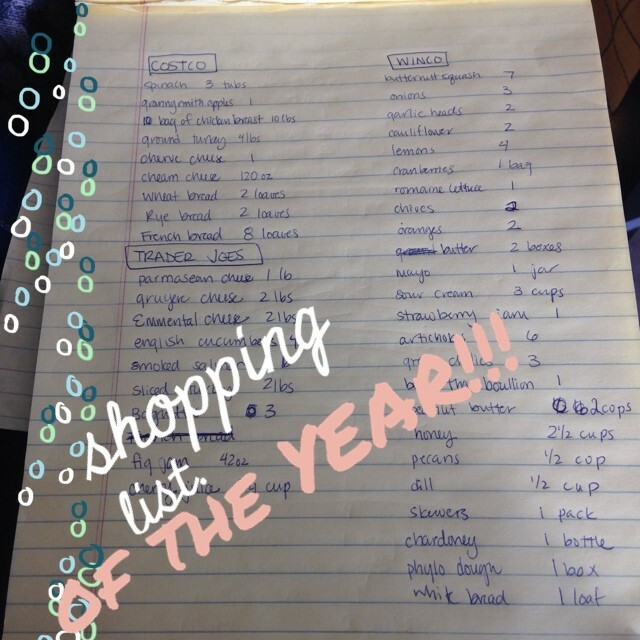 I spent this morning pouring over my recipes, and writing up my shopping list for this big grocery adventure. I love grocery shopping so today is going to be extravagant!! I’m pretty excited to pull this off. Stay tuned to see pictures of how this spread turns out. If you’ve cooked for a crowd of 30 or more, let me know any tips or tricks you’ve done to pull this off. LIKE and follow mybetterbalance on Facebook. Posted in Uncategorized and tagged catering, cookbooks, foodie, grocery shopping, homemade meals, menu, shopping list, thanksgiving, Wedding. Bookmark the permalink. Starting tomorrow if we are eating at least 6x/day, which all of my clients do, you have 240 meals until the end of the year. Even if you have 3 holiday meals planned and lets say 5 holiday parties/events that are not in line with your health goals that’s only 8 meals total that you can plan for/schedule in leaving you with 232 other opportunities to make healthy choices and stick to your plan. Isn’t that cool? I don’t see any reason why making great progress through the holiday season isn’t possible! Rather than waiting til after the holidays (which come every year), you can choose health now and be down 15-30 lbs BEFORE the new year and feel AMAZING! That sounds terrible doesn’t it? (wink). It’s all about perspective. When you change the way you look at things, the things you look at change. I guarantee losing 15-30lbs before New Year, having more confidence, energy, and just feeling better overall will give you more satisfaction than gaining the average 7-10 lbs during the holidays and feeling terrible. Think about it. You are ultimately in control. If you need help reeling in that control, email me at mybetterbalance@gmail.com and let’s set up a complimentary consultation to see how you can control your health and choices. 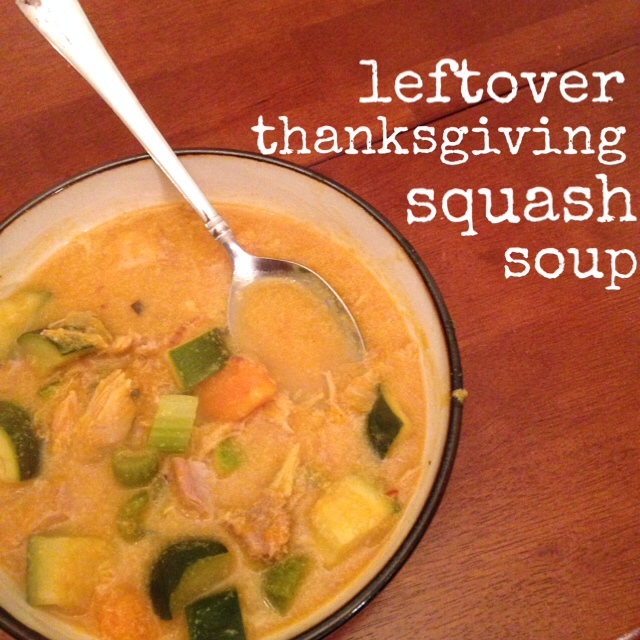 I threw this beauty together tonight on a whim… it was like Thanksgiving in a bowl. Honestly, when ever you combine sage, squash and turkey, it is Thanksgiving in a bowl. If you’ve read any of my recent posts, you know that I recently baked a 20+lb turkey, upside down mind you. And now I have gobs (or gobbles) of meat in my freezer. So after a hard workout at the gym (really I did heady intervals on the elliptical for an hour, only because I can water food network and sweat at the same time. It makes it that much more enjoyable [ and really, I’m having a hard enough time walking right now as it is. I worked with a trainer on Monday and did squats until the sun went down and my poor legs are still mush]) I needed something quick and hardy to put together. 1. In a large soup pot, heat ghee or butter over medium heat. Add in onions, celery, and squash. Stir and cook until the vegetables get a golden brown coloring. Add milk, cheese, zucchini and turkey. While simmering, continue to stir so the milk and cheese don’t scorch. Taste to see if you should add any salt or pepper. Depending on the stock you use, you may not need to add any. **If you wanted to make this paleo, you could substitute coconut milk and not use cheese. However, if you eat primal, go ahead and add in milk and cheese. 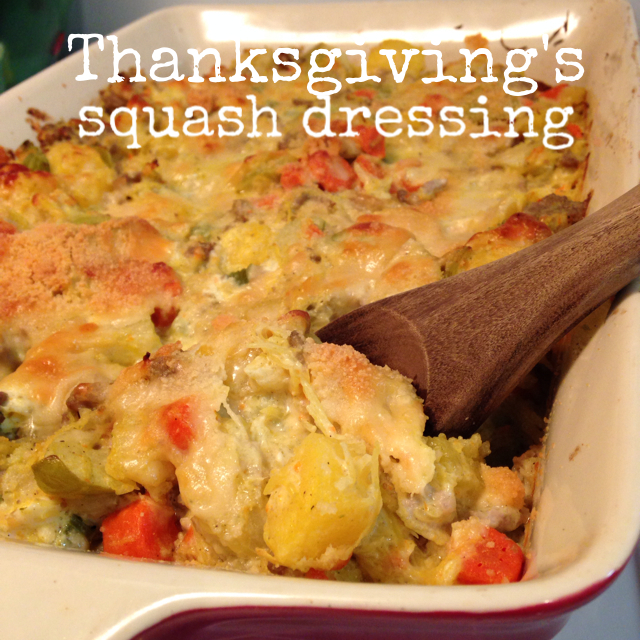 Comment below if you try this recipe, or if you have a favorite way to eat left over turkey. Posted in Uncategorized and tagged cookbook, dinner, ghee, healhty recipe, healthy cooking, healthy food, healthy meals, homecooked, homemade meals, leftovers, pack your own lunch, paleo, recipes, soup, thanksgiving, Turkey. Bookmark the permalink. 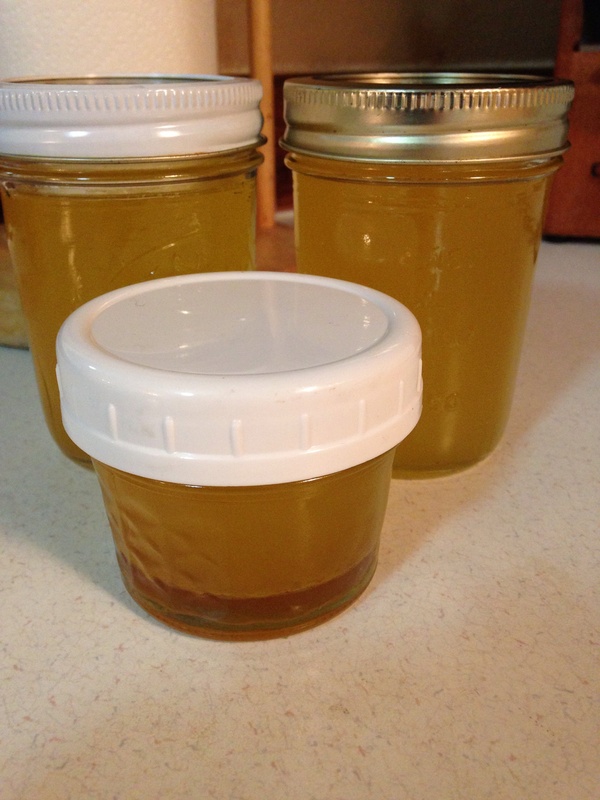 so I made my own turkey butter- or really I guess ghee might be the better term. But if turkey’s can be butterball, then I guess I can call this butter. I’ve been doing some research on the best fats for cooking. For health purposes, for heat purposes and for flavor. I would argue that as far as animal fats go, strive to get the organic, free range style that grew up eating the foods God designed the animal to eat. (ie: not grains) Animal fat has gotten a bad wrap because of cholesterol but new research is debunking what we once believed was the demonic side of fat. We actually need some cholesterol. Do your own research. I’ve learned a tone from listening to the podcast That Paleo Show. Anyway, back to the turkey butter. I made a giant turkey. And I collected everything that dripped from it. I put In the fridge to let the fat separate. Using a spoon, scoop off the fat and place in a sauce pan to reheat. (render)Strain through a coffee filter to remove any meat and herbs. Apparently those will rot! Yuck. The you can freeze or fridge it until your ready to use it. For the rest of the dripping liquid, reheat, strain and use as stock. 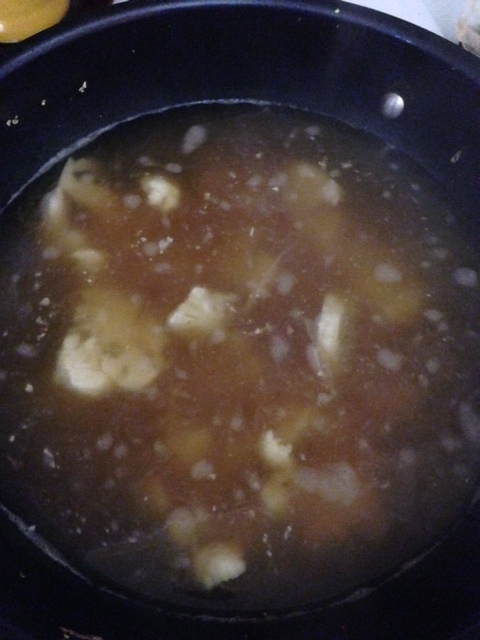 You can save the bones from the carcass after you’ve picked it clean and boil them in water to make another stock. Chill the liquid to scrap off more turkey butter, and render the same way you did earlier. Posted in Uncategorized and tagged butter, cholesterol, fat, health, homemade, thanksgiving, Turkey. Bookmark the permalink. Posted in Uncategorized and tagged cousins, Eola Hills Winery, family, feast, thanksgiving, the colony, Wedding. Bookmark the permalink. Posted in Uncategorized and tagged daughter, mother. Bookmark the permalink. 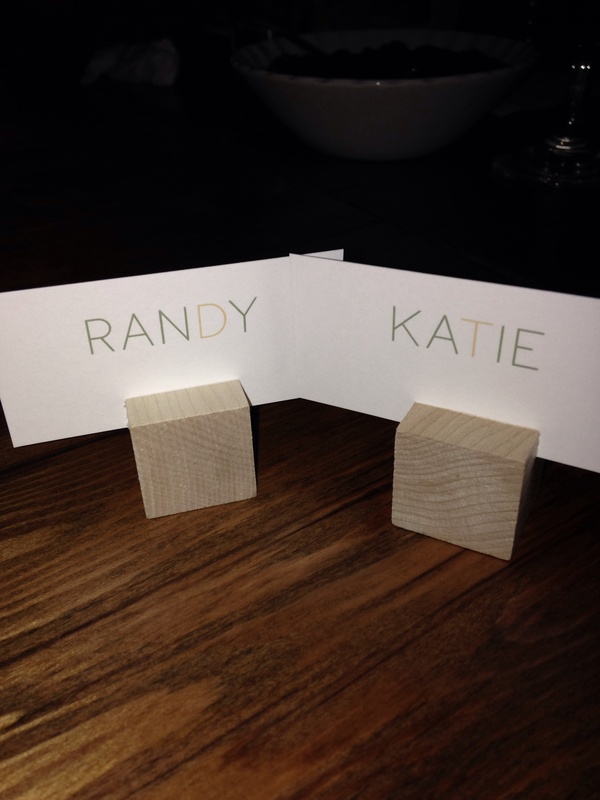 Congratulations Dan and Vana! A beautiful night for beautiful people. It was truly a night of thanksgiving. A feast for kings. You would be shocked to know I didn’t take pictures of my food, although it was too good for words. Turkey, lamb, squash and corn-taters. Yum yum!! Beautifully decorated too. Vana had sown little squares together to make garland, and panted really rad geometric and graphic patterns to plywood for their backdrop. I was telling my mom that it’s way more fun to go to family events as a adult. Not only can we drink lots of wine now, but we actually talk!! And I like these people. As kids we were so spread out by age or location that we had little to talk about. But now we are significantly less awkward and we know how communicate beyond our internal family shananagins. 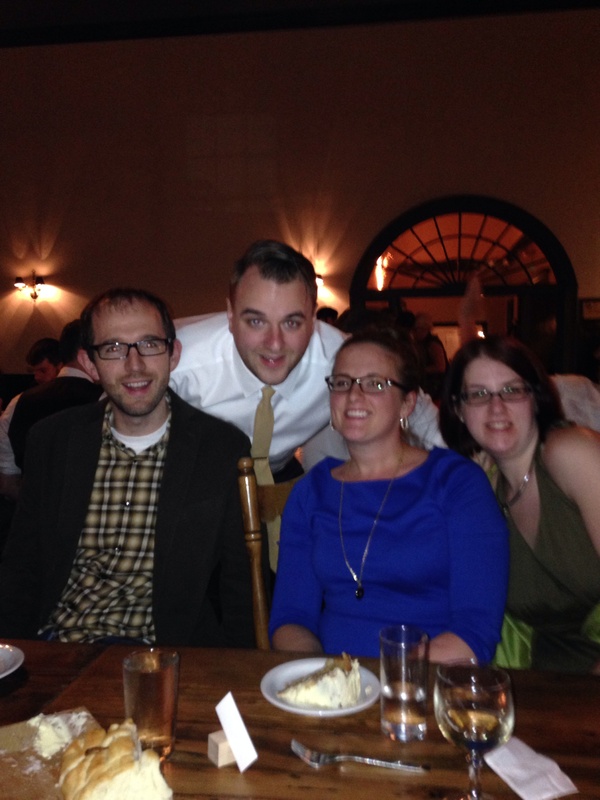 I’m glad we got to spend the evening together, welcoming another one to the clan. PS- check out The Colony. It was a really sweet, very “Portland” venue. how I do as much as I do. To be honest, I don’t know other than the grace of God, and the gifting of planning and creativity. With out planning and creativity (being able to spin things around, twirl in some awesome and sprinkle on some uniqueness) my days would be dull and lifeless. So I opt for awesome days. One of the major things that helps me in life stay balanced and sane is to prep food. I LOVE FOOD. You already know that about me. I love to cook, grocery shop, plan, search for recipes and even sometimes I like to do dishes (this is rare). But for the most part, as much as I love the kitchen, I have too many other things to do than stay in there all day everyday. So in order to still create healthy, flavorful meals for my husband and myself, and have meals that can turn into lunches and left overs – I cook for 10 rather than 2. Things just seem to last longer when you have more…. Squash tip: Roast 1 more squash than you’ll need for your recipe. Keep it in the fridge and use it for another recipe later in the week. Best part about it is that it makes for an easy meal later and you’ll use less electricity heating up your oven only once. Posted in Uncategorized and tagged acorn, butternut, cookbooks, healthy cooking, leftovers, spaghetti, squash. Bookmark the permalink.